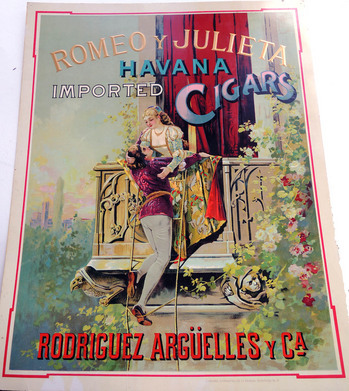 Romeo y Julieta, imported Havana cigars. Rodriguez, Arguelles y Ca., n.d. [after 1902]. Published by the Compania Litografica, Havana. Chromolithographic poster. 62 x 50.4 cm. Graphic Arts Collection GC149 Ephemera. The French expatriot artist Frédéric Mialhe (1810-1881) lived and worked in Cuba from 1838 to 1854. He was brought there to be a landscape painter for the newly established lithographic press of François Cosnier and Alexandre Moreau de Jonnes under the sponsorship of the Royal Patriotic and Economic Society of Cuba. With three presses, five operators, and one master painter, it was “one of the most outstanding enterprises of its kind ever attempted in Cuba” (Cueto). It wasn’t until 1861 that chromolithograph came to Cuba but once the technicians were trained, production was enormous. A particular relationship between the tobacco industry and the chromolithographic printers developed. Everything from the largest posters to the smallest cigar bans were printed and embossed in elaborate multicolor designs.